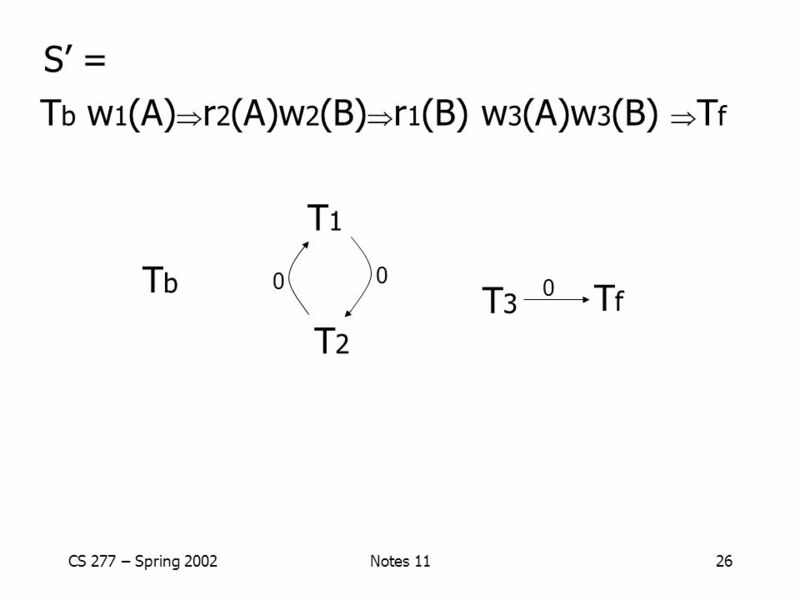 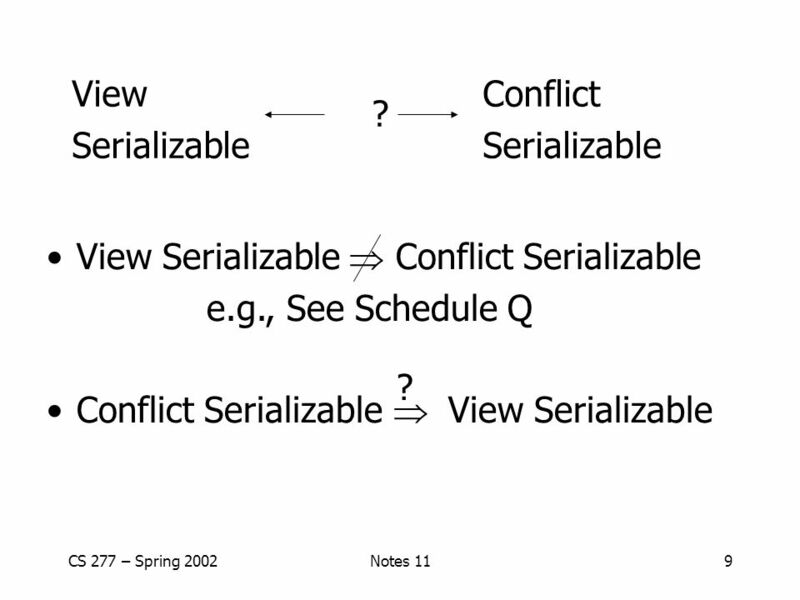 4  Not conflict serializable! 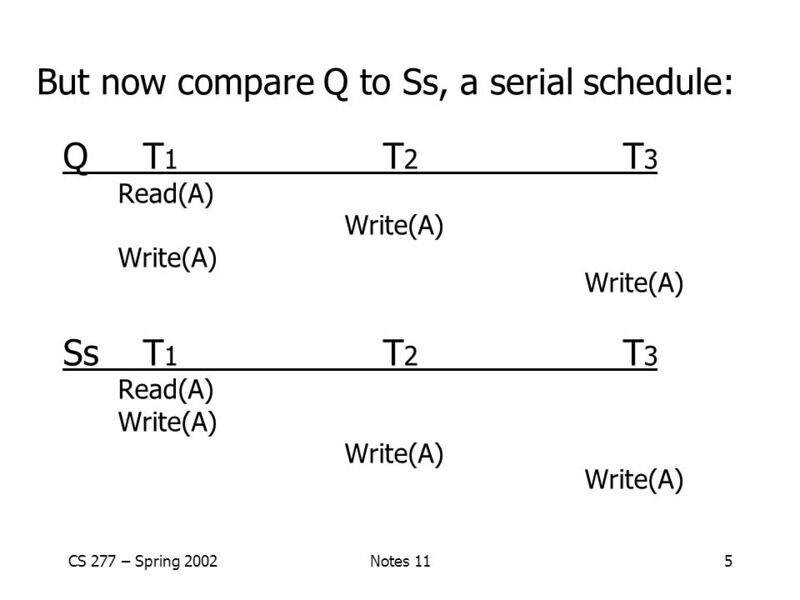 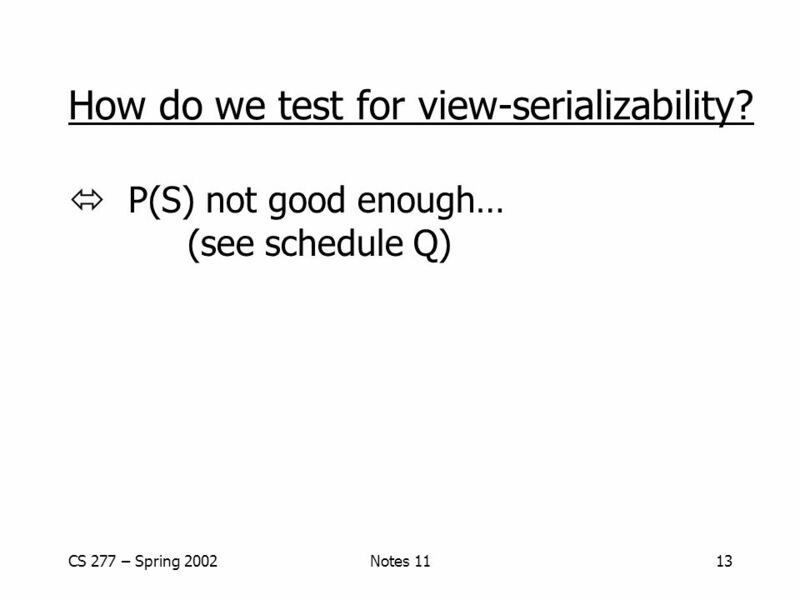 13 How do we test for view-serializability? 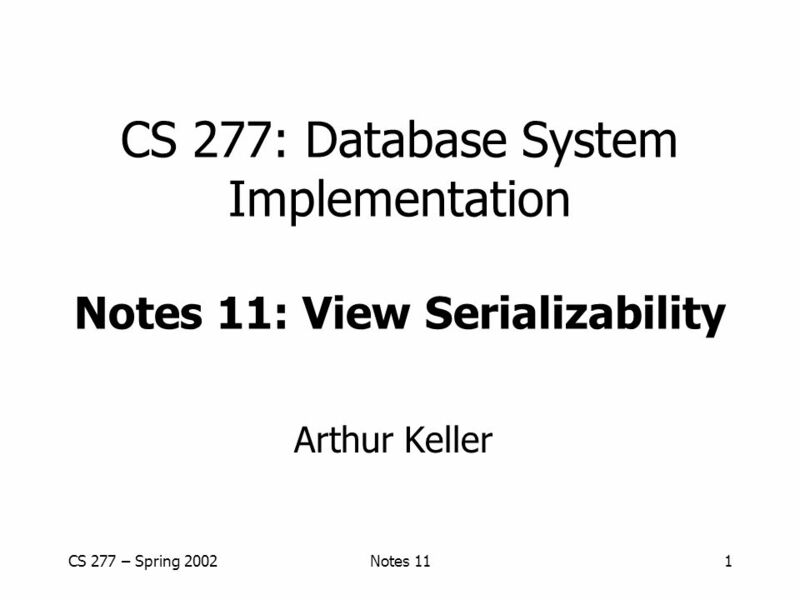 Download ppt "CS 277: Database System Implementation Notes 11: View Serializability"
1 Shivnath Babu Concurrency Control (II) CS216: Data-Intensive Computing Systems. 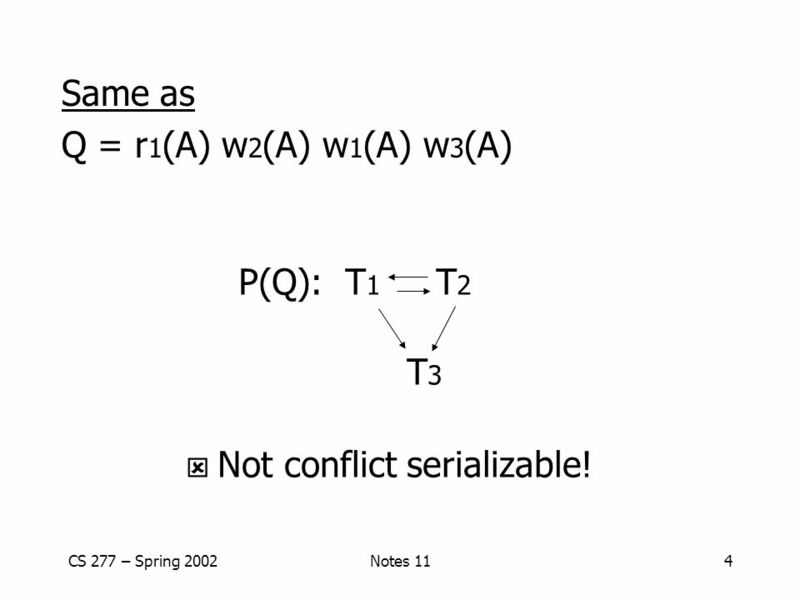 Cs4432concurrency control1 CS4432: Database Systems II Lecture #21 Concurrency Control : Theory Professor Elke A. Rundensteiner. 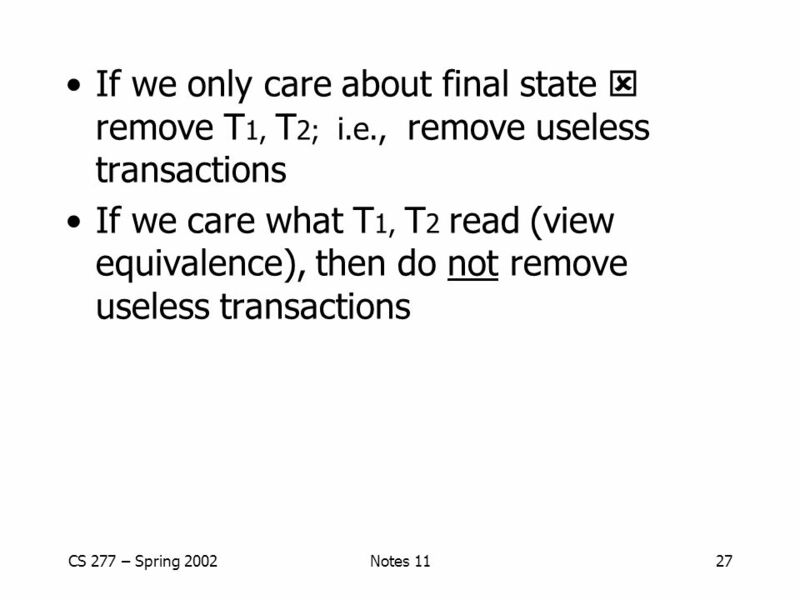 More About Transaction Management Chapter 10. 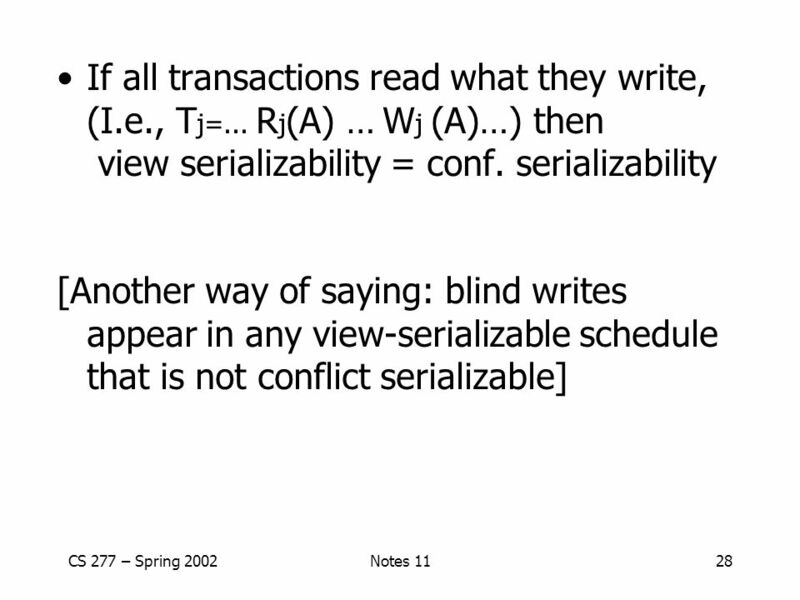 Contents Transactions that Read Uncommitted Data View Serializability Resolving Deadlocks Distributed Databases. 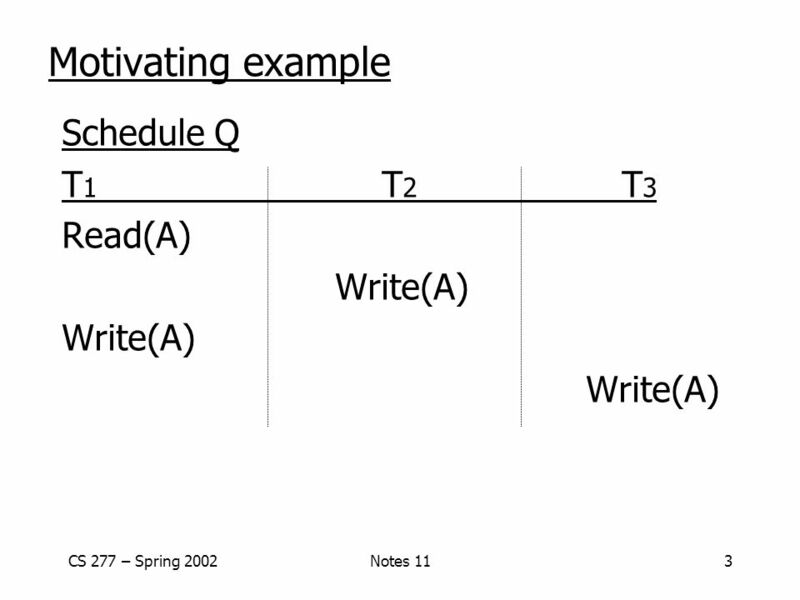 Unit 9 Concurrency Control. 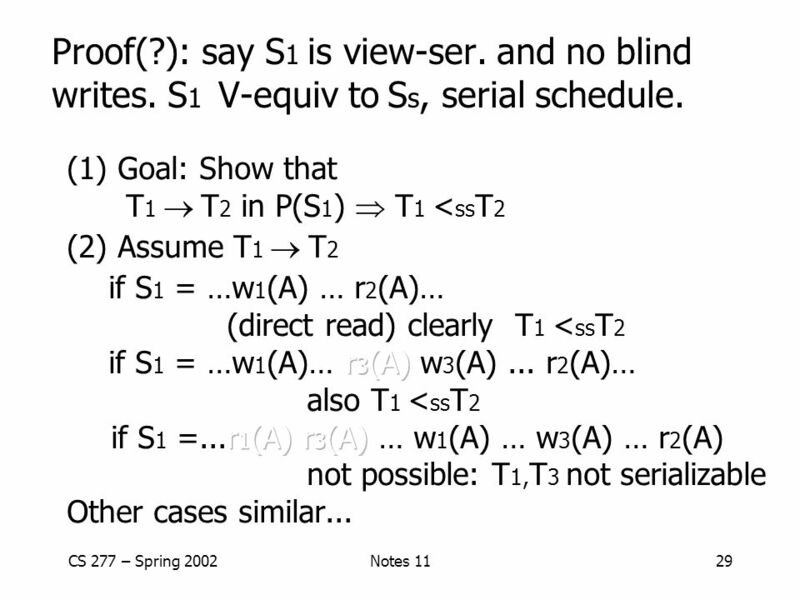 9-2 Wei-Pang Yang, Information Management, NDHU Content  9.1 Introduction  9.2 Locking Technique  9.3 Optimistic Concurrency. 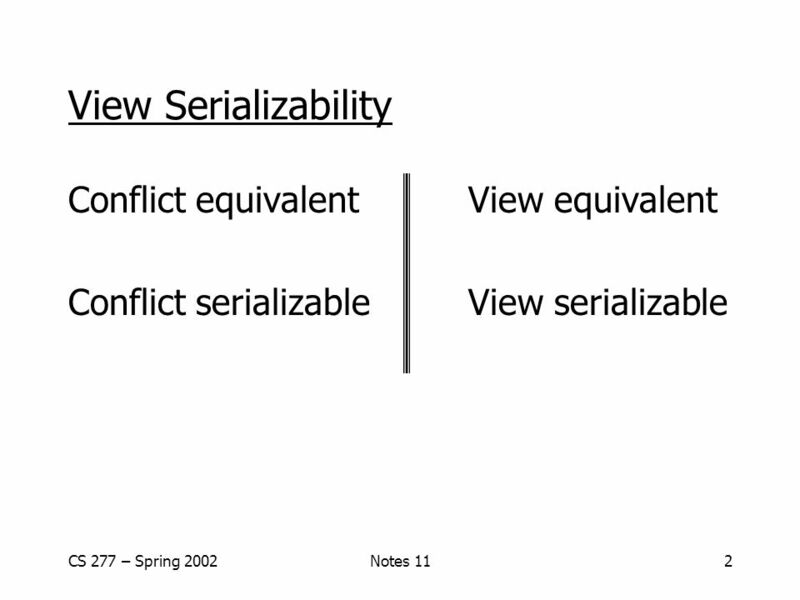 Conflict Serializability Example Murat Kantarcioglu. 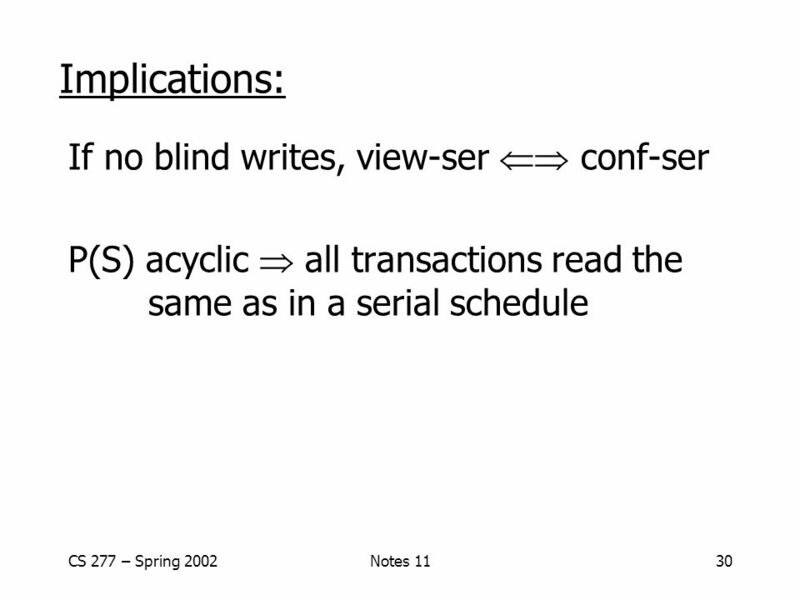 1 Lecture 11: Transactions: Concurrency. 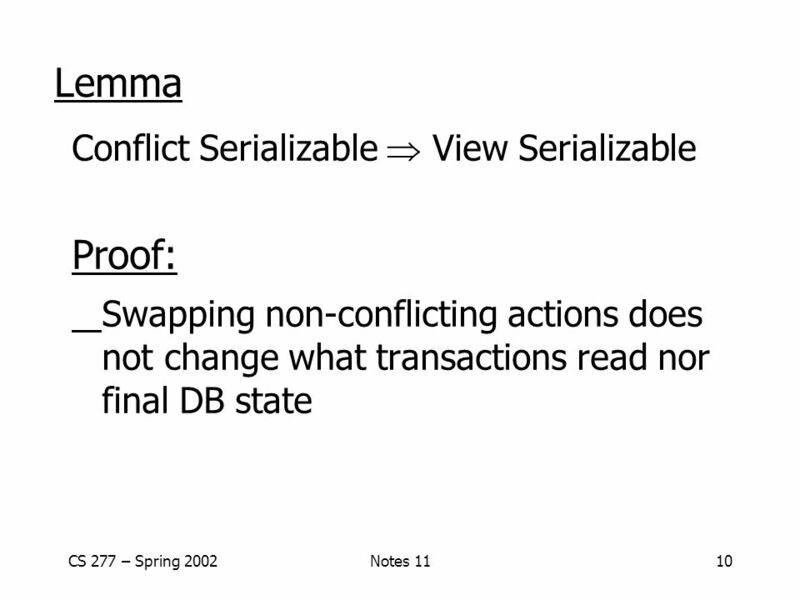 2 Overview Transactions Concurrency Control Locking Transactions in SQL. 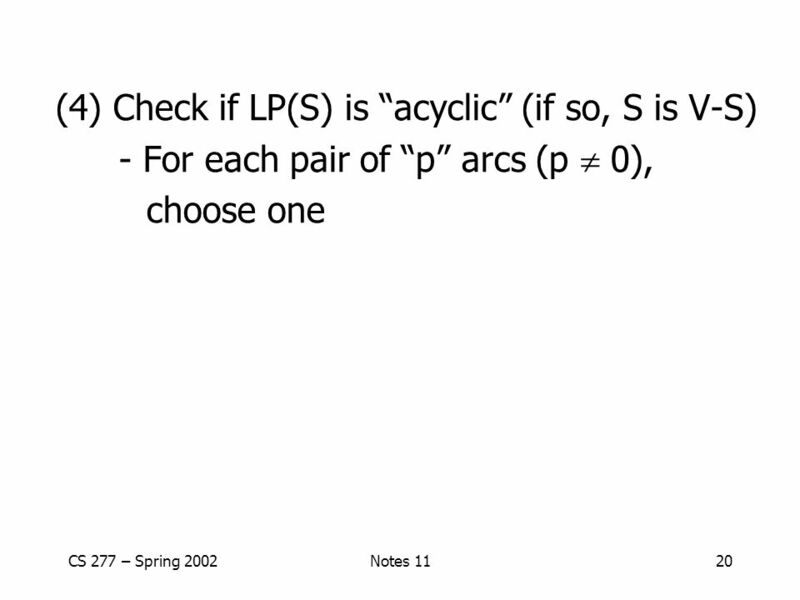 Introduction to Database Systems1 Concurrency Control CC.Lecture 1. 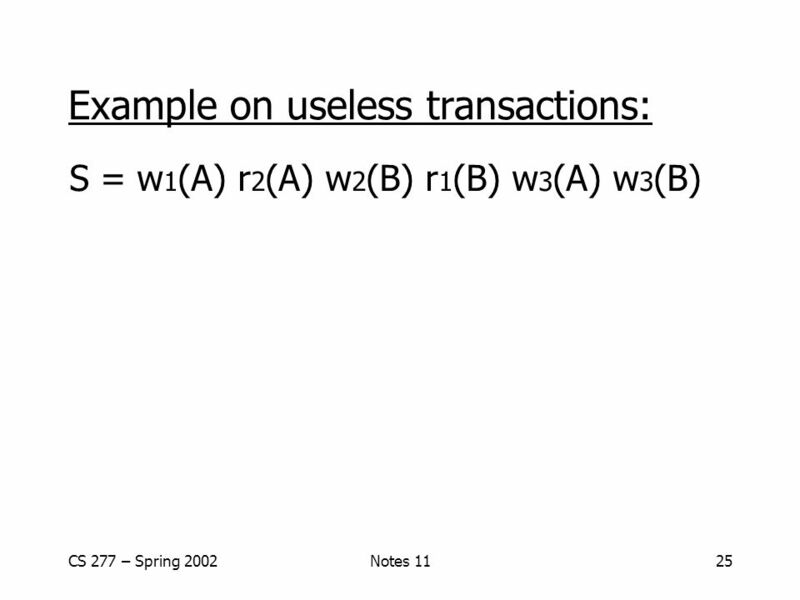 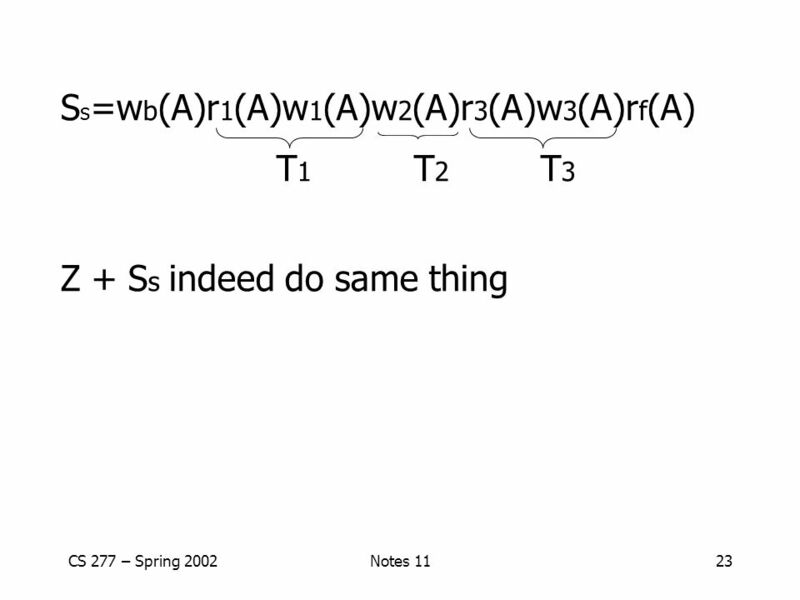 1 Lecture 10: Transactions. 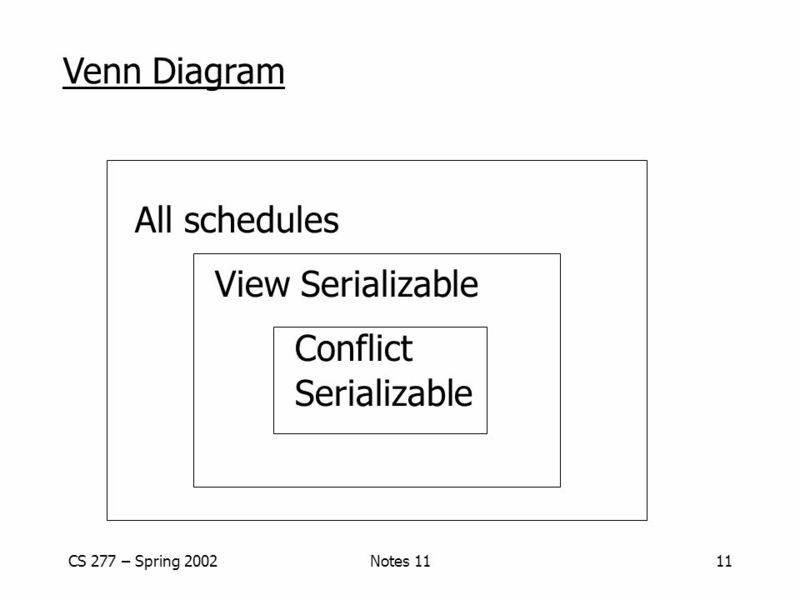 2 The Setting uDatabase systems are normally being accessed by many users or processes at the same time. 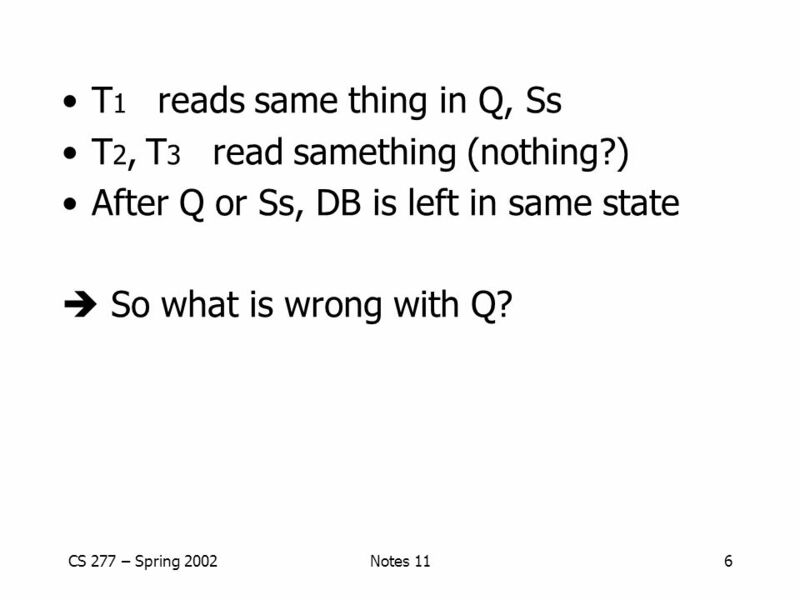 wBoth queries and. 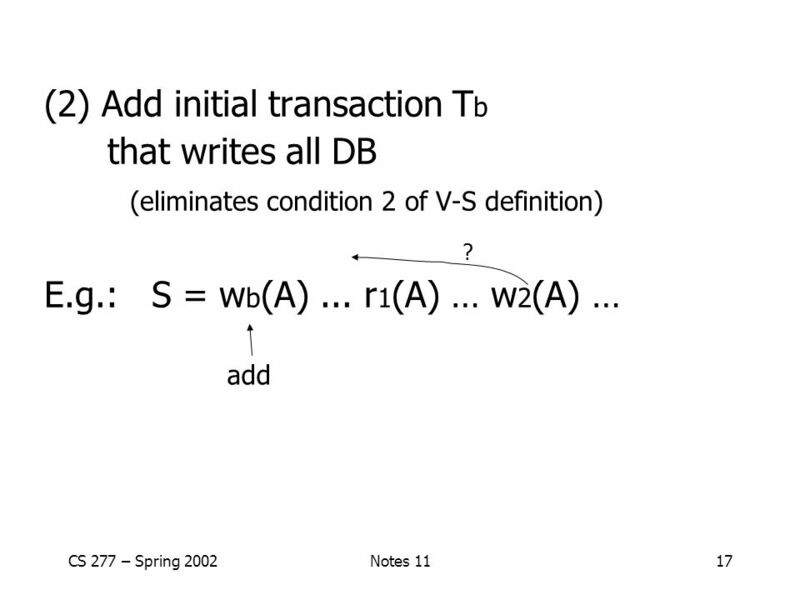 Transaction Management: Concurrency Control CS634 Class 17, Apr 7, 2014 Slides based on “Database Management Systems” 3 rd ed, Ramakrishnan and Gehrke. 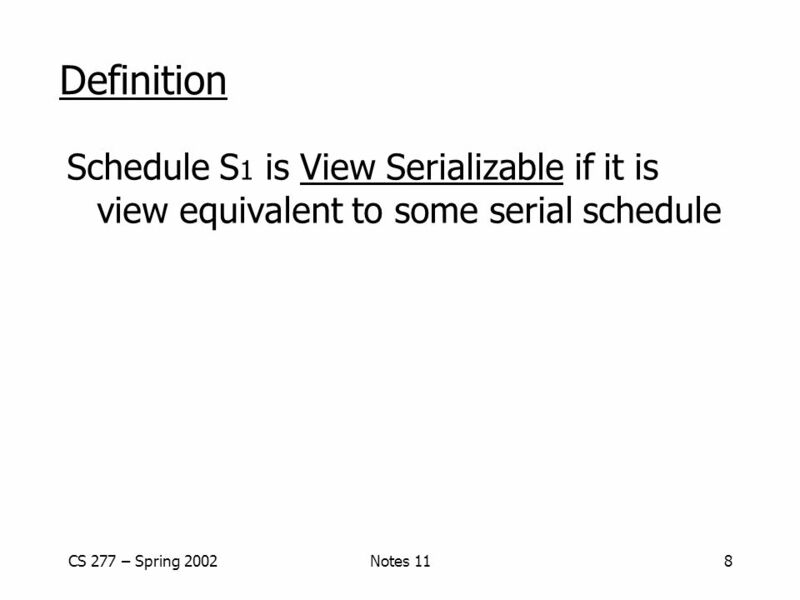 Database System Principles 18.7 Tree Locking Protocol CS257 Section 1 Spring 2012 Dhruv Jalota ID: 115. 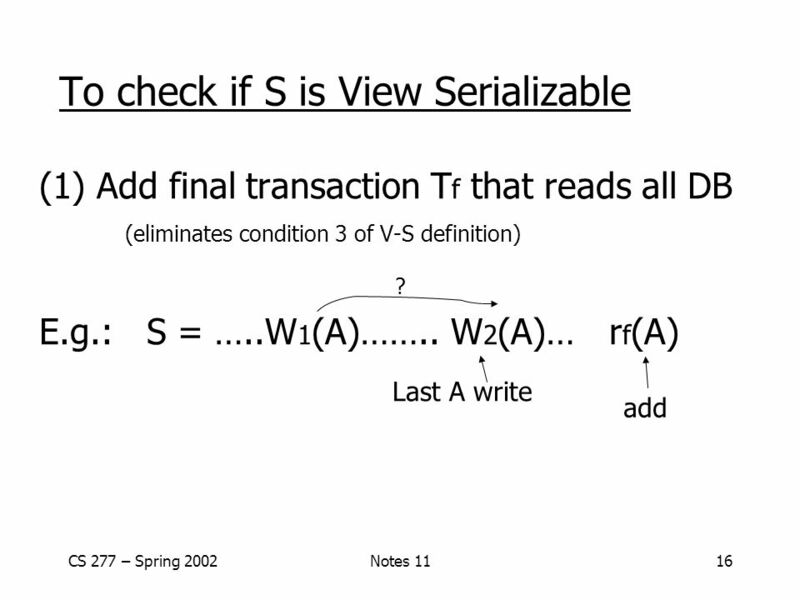 Chapter 15: Transactions Transaction Concept Transaction Concept Concurrent Executions Concurrent Executions Serializability Serializability Testing for. 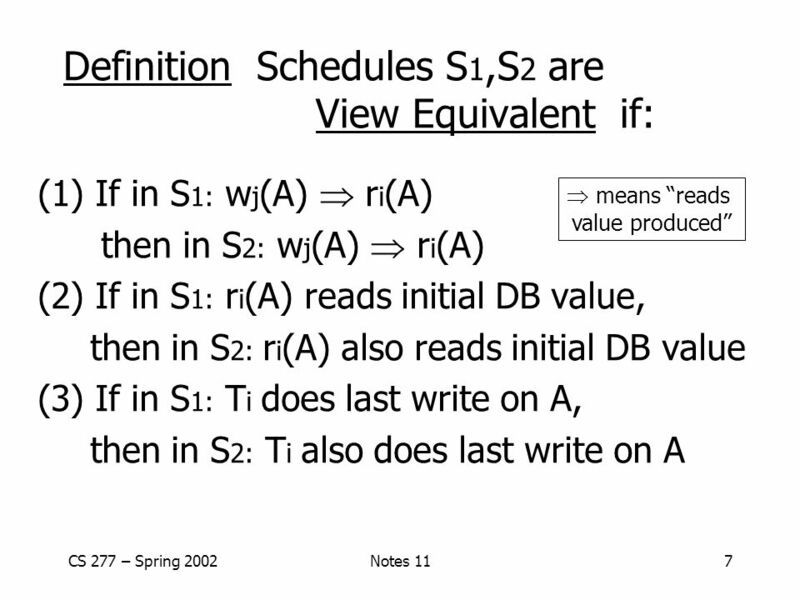 Cs4432concurrency control1 CS4432: Database Systems II Lecture #22 Concurrency Control Professor Elke A. Rundensteiner. 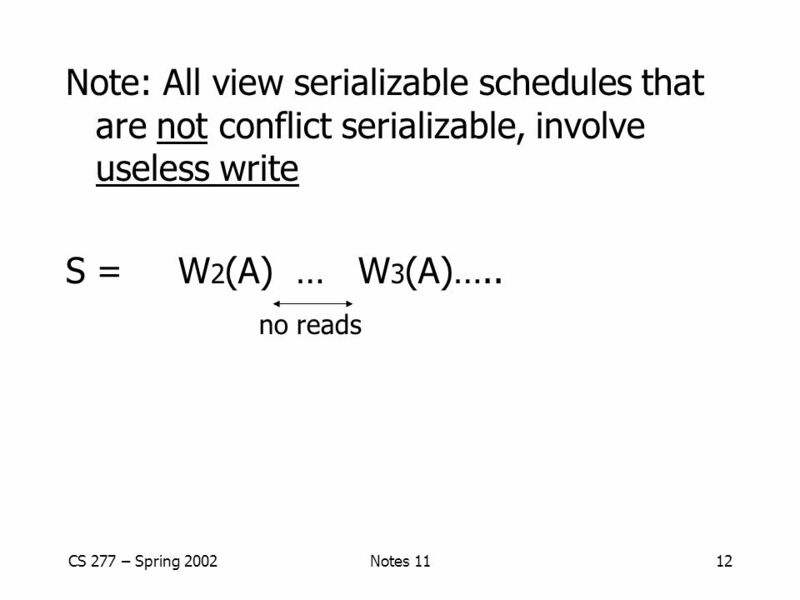 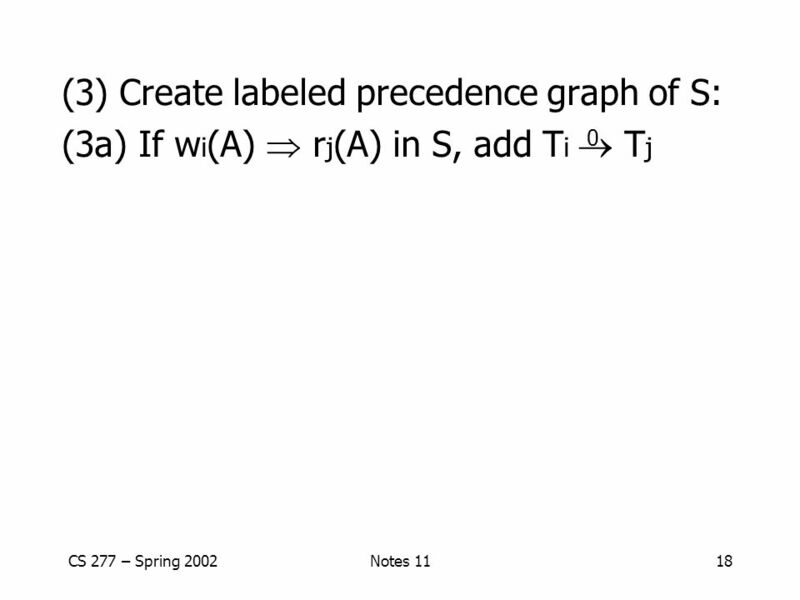 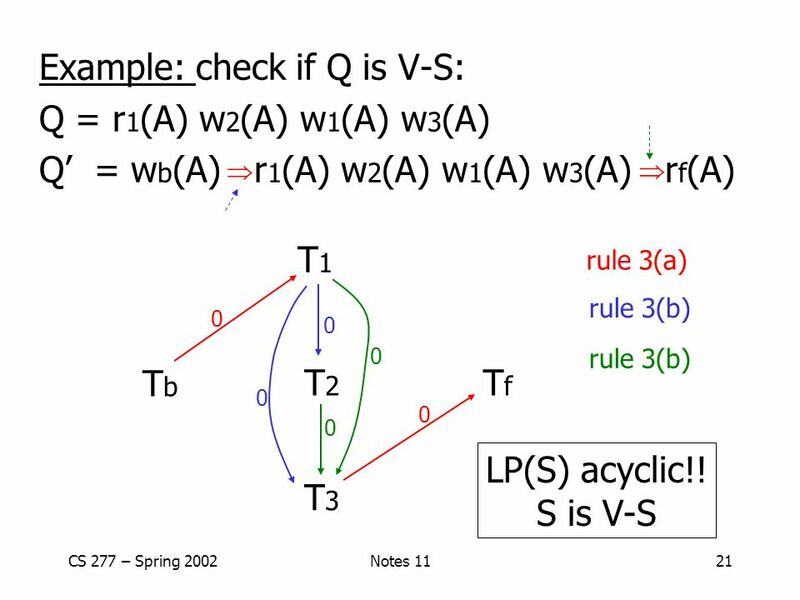 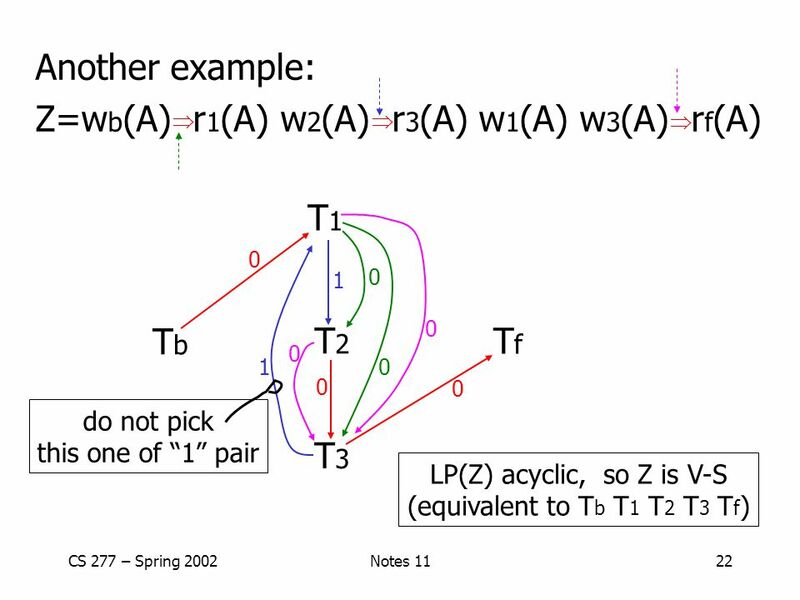 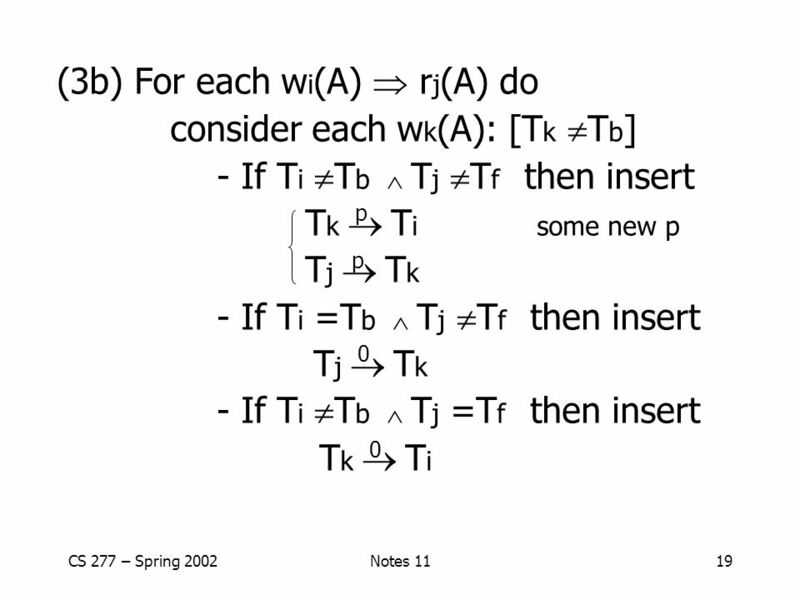 1 ICS 214B: Transaction Processing and Distributed Data Management Lecture 2: Enforcing Serializable Schedules Professor Chen Li. 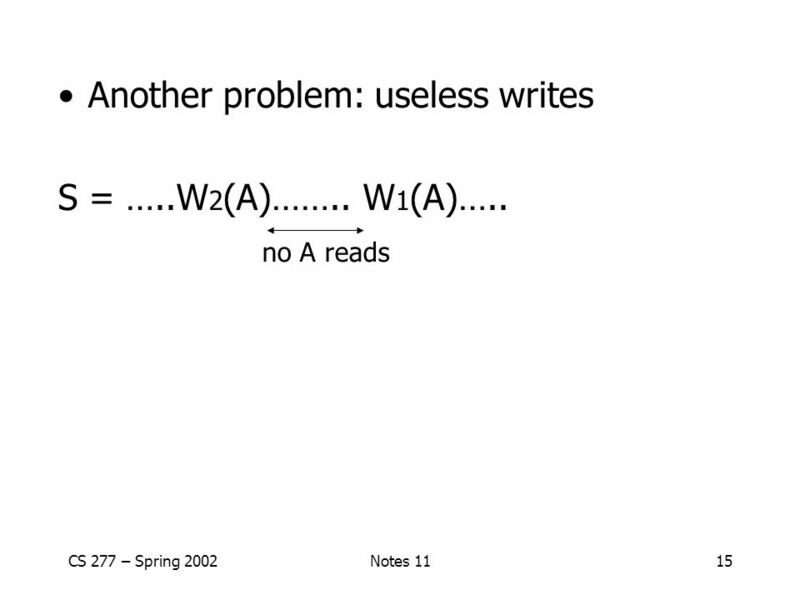 Cs4432concurrency control1 CS4432: Database Systems II Lecture #23 Concurrency Control Professor Elke A. Rundensteiner. 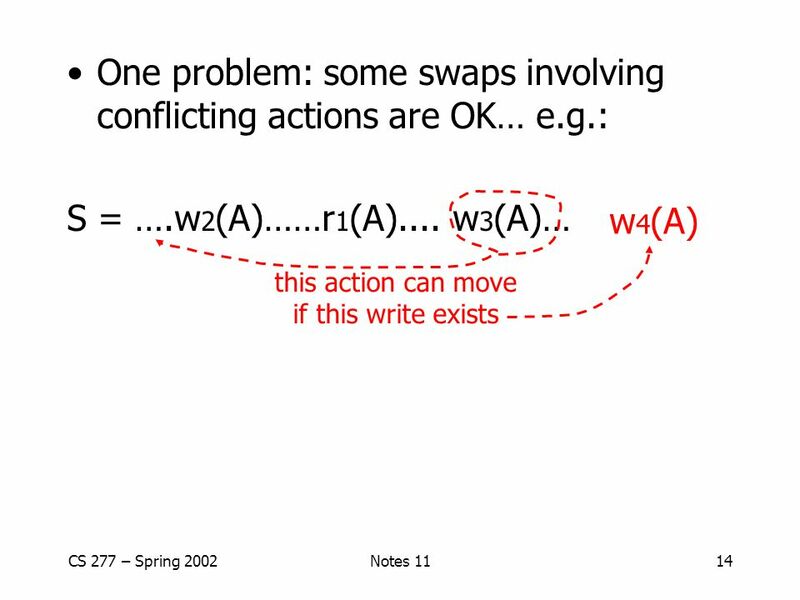 Cs4432concurrency control1 CS4432: Database Systems II Lecture #22 Concurrency Control: Locking-based Protocols Professor Elke A. Rundensteiner.